Mon Tulfo Shows His Light and Funny Side on His 'Gandang Gabi Vice' Guesting! 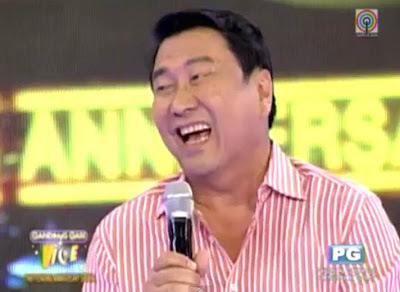 Controversial columnist Mon Tulfo made viewers laugh on his Sunday 's (May 27) guesting in the trending TV program "Gandang Gabi Vice." He is Vice Ganda's one of the two guests on the said night inline with the Trending Anniversary Celebration of the said show. We always see Sir Mon serious and straight forwards on the different news or TV programs. But on that night, we saw the funny and lighter side of him! He answered all the questions thrown by Vice to him and was always game to Vice Ganda's humor! What more, he even danced to the tune of the Wonder Girl's hit "Nobody!" Mon became controversial after being involved in NAIA brawl with celebrity couple Raymart Santiago and Claudine Barretto. Aside from Mon, another controversial personality Andi Eigenmann was also Vice Ganda's guest on the said episode. Andi on the other hand was involved in a bar fight with ex-boyfriend Albie Casiño.